2019 DATES BEING ANNOUNCED S00N. Sign-up and be the first to know when tacos & tequila are taking over your town. Select Your City Dallas Denver Los Angeles Miami NYC San Jose Scottsdale Seattle Someplace Else! 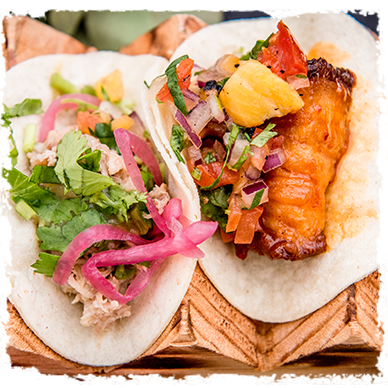 Every Taco Tuesday, every Cinco de Mayo, every beach vacation has led you to this moment: It’s The Taco Takeover, and your palate is ready to judge every last bite and sip. Join us for 10+ chefs serving up their best taco dishes, a cocktail contest, and tons more. It’s your job to pick the winners, but since it’s an entire day dedicated to tacos and tequila, you basically win just by attending. Come hungry, because you’ll spend all day chowing down on the best tacos and Mexican-inspired dishes from your favorite local chefs. We’ll have local bartenders onsite pouring their very best creative cocktails -- but only one will be unbeatable. With live music, games, and lots more, we promise not to slow down the fiesta until you do.